One of the first projects Holly and I undertook under the Shiny New Toy name, MeltingSpot, is now live. 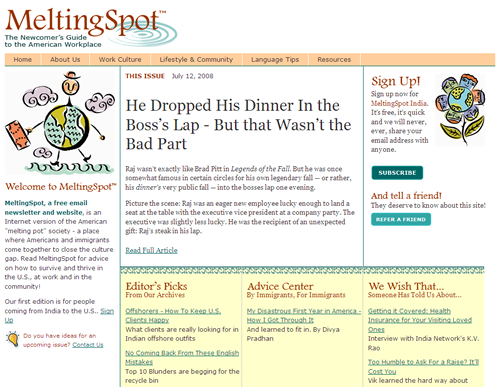 MeltingSpot, a free email newsletter and website, is an Internet version of the American “melting pot” society – a place where Americans and immigrants come together to close the culture gap. Read MeltingSpot for advice on how to survive and thrive in the U.S., at work and in the community! Not being a web programmer or developer, Danielle was interested in a simple way to manage her web content without having to resort to using Dreamweaver or reading HTML. WordPress to the rescue! But at the same time, she wasn’t interested in having MeltingSpot appear as a blog. In addition to developing a custom WordPress theme, we showed Danielle you how to use WordPress features, such as excerpts and category templates, to have her magazine style website content appear exactly how she wishes. We also included some banner ad management utilities so that she can insert and set ad rotations from within the WordPress admin dashboard. Finally, we integrated email newsletter subscription utilities.